Here are some pictures of a very sunny day in Santa Barbara where me and my wife visited my brother in law. We went for a lovely boat ride as Santa Barbara literally is a haven for yachts. We also had dinner at a lovely restaurant called the Brophy Bros Restaurant which had the freshest clams. 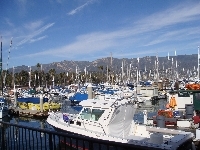 Did you enjoy Santa Barbara Docking and have you been on a holiday in Santa Barbara, United States?